A man claims to have taken the most credible video footage of Scotland's Loch Ness monster, Nessie. His name is Gordon Holmes (bottom) and he is an amateur scientist, a cryptozoologist, or someone sho studies "hidden" animals. His footage shows a dark form apparently swimming underwater. "I was minutes from going home but I saw something moving and dashed out of the car and switched the camcorder on," says Holmes. "About 200 yards away from me I could see something in the water. It was definitely a creature propelling itself through the water. It was fairly bubbling along the water. It was streaking along." Holmes has been doing his own research on the loch (lake Loch Ness), recording sounds with special hydrophonic equipment. It's a shame that what was swimming never broke the surface. It's anybody's guess what the dark shape is. Do you think it is really a primitive creature long thought to be extinct? 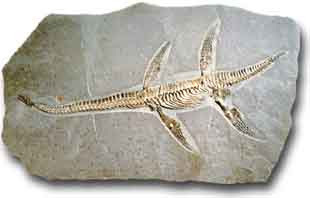 Below is a fossil of a plesiosaur. It fits many of the descriptions of Nessie. 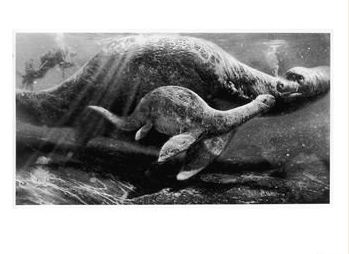 In fact, many believe that Nessie is actually a living plesiosaur. You can see the controversial video footage here.